24K gold styling surface allows for even heat distribution, titanium plates are durable and chemical-resistant to styling products, and the Micro-Shine finish provides effortless glide and minimizes frizz. Achieve quicker styling with multi-directional floating plates that provide full hair contact. 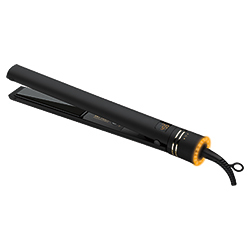 Features multiple heat settings up to 455 degrees, rotating temperature dial, dual voltage, 2-hour auto shut-off, soft touch finish and comfortable grip, digital LED temperature display, and 9 ft. swivel cord. Includes heat-resistant glove. Lifetime warranty.